At the WW2BW conference in Miami the USAID Water Team stated it was actively promoting a holistic approach to freshwater and coastal resources management as embodied in its white water to blue water, ridge-toreef or island approach. It was further reported that USAID works in 16 countries in the wider Caribbean (including Honduras) on projects that directly promote the protection and improved resource management of coastal and corral reef systems. The projects described the promotion of best management practices in upper watersheds and in both rural and urban water supply and wastewater treatment programs for improved coastal water quality and quantity. USAID is certainly one of the key U.S. Agencies in helping to implement the WW2BW strategy in the wider Caribbean. • Just and democratic governance: more responsive, transparent governance. • Economic freedom: open, diversified expanding economies. In the USAID strategy overview (page 4), two statements attracted the Teams attention as the review was conducted. 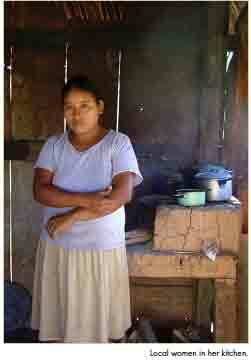 • Honduras is suffering from a growing economic crisis, especially in the rural sector. 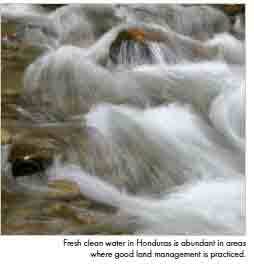 Droughts, floods, and low commodity prices that cyclically occur in Honduras have negatively impacted many farmers. These factors have accelerated migration to urban areas within Honduras, adding more pressure on limited municipal resources. • Conflicts over uses of natural resources, ineffective environmental management and controls, a lack of economic alternatives, and rapid population growth threaten the natural resource base on which Honduras’ economy is largely dependent.